Going to the lake is a part of life down here in the Ozarks. We spend more time there than at the pool. Therefore, we have oodles and oodles of pool noodles. (That sounded so cheesy.) It seems like we collect more each year! The Dollar Tree, Wal-mart, even Michaels are stocking them because they are such a hot ticket item! Unless you live under a rock, you have probably encountered a pool noodle at some point in your life. Have you seen all of the unconventional ways you can use a pool noodle? With summer being right around the proverbial bend, you need to be prepared. Prepared for what, you ask? Boredom. Kids whine and complain about school but we all know they also whine and complain when they get bored during the summer. There are so many ways to use pool noodles. Why not give them to the kiddos so they can get creative? That’s way more fun and stimulating than sitting behind a video game all summer. My son is old enough to make half of these himself. 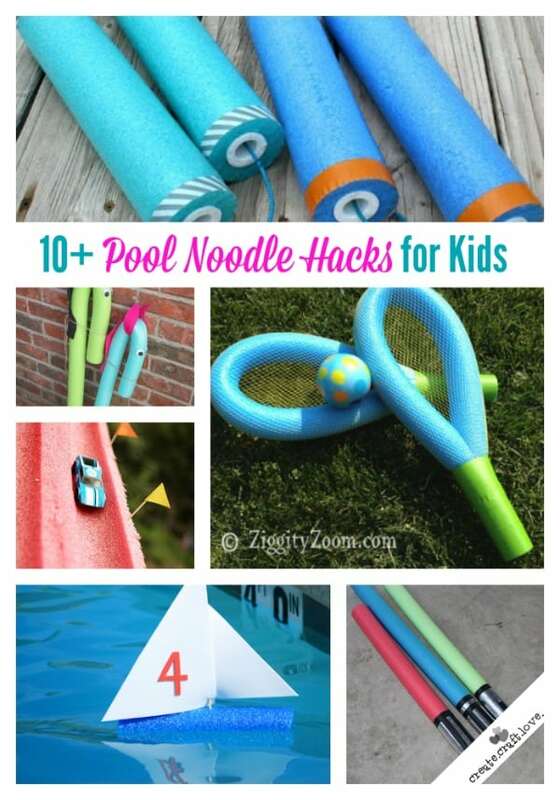 Here are 10+ Pool Noodle Hacks for Kids! Simply click the link below the picture to view the original post/tutorial! Which is your favorite? 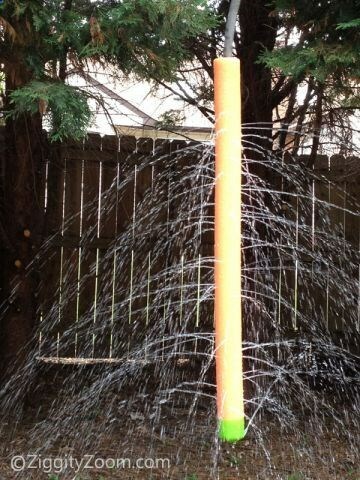 You could totally use that pool noodle sprinkler in the garden too! I’m thinking about creating a bike/car wash entirely made from pool noodles! Just think, it’s fun and they can knock out some cleaning. That is a Mom Jedi trick! And speaking of Jedis, how about those lightsabers? Hashtag: awesome. 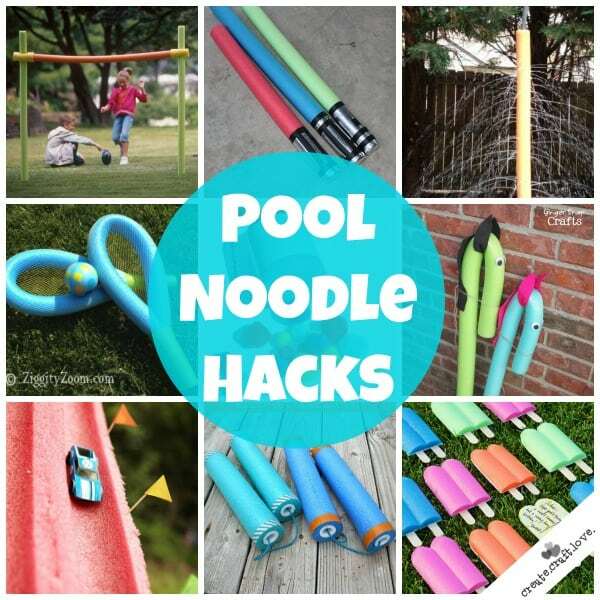 Aren’t those Pool Noodle Hacks fabulous?! Seriously. When the zombie apocalypse comes, I want to have a cache of pool noodles (and canned goods)! Go to your local dollar store and purchase four or five pool noodles. Challenge your kids to come up with something NOT seen on this list! Send me a pic and short tutorial and I would be happy to feature it here at Create.Craft.Love! Who knows? Maybe your idea will be the next to go viral on Pinterest! Run out the garage and see what you can come up with! I’m sure the kids will have a blast creating and playing with these Pool Noodle Hacks! I can’t wait to see the results! 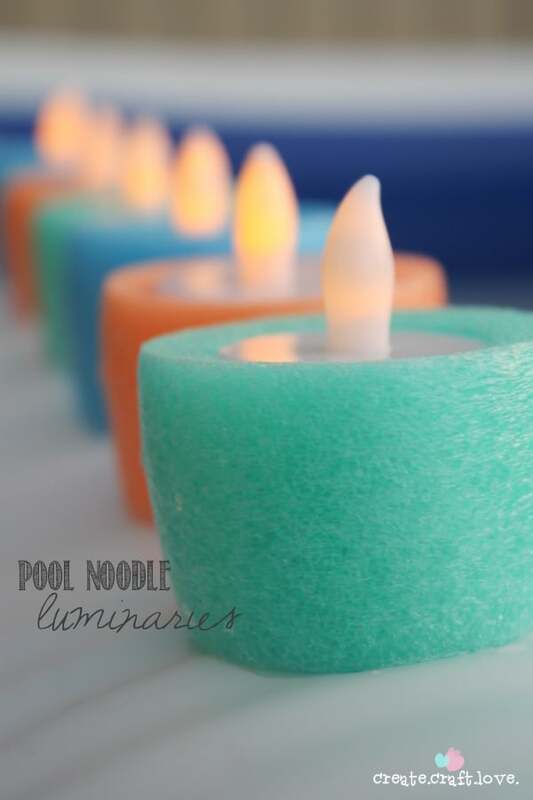 If you’re looking for more pool noodle ideas, check out my Pool Noodle Luminaries!